Just so we are all caught up, here are some things that have been going on during my impromptu blog break, for which I don't really have a good excuse except that I have been exhausted and for a while in fact, was sure that I had mono but then it turns out I am just naturally tired and lazy with no viral assistance needed. 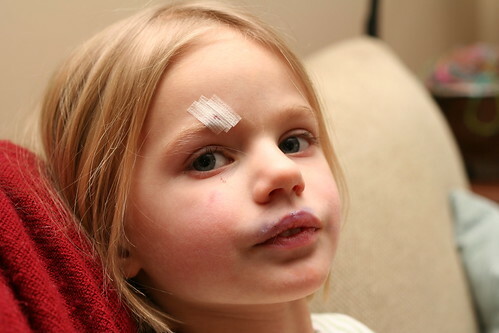 Feb 11: Bella gets hit in the head (deliberately) with a large chunk of ice at preschool. I get called at work and told they can't stop the bleeding, although it is only bleeding a little so don't panic even though you just heard the words can't stop the bleeding and are trying not to throw up. I take her to the doctor and she gets patched up, so all's well that end's well. Except that the incident starts us down a dark path of doubt about our choice of daycare. Because, first of all, how f'd up are you to hit a little girl with a large chunk of ice IN THE FACE? And why haven't you been sent home when I pick up my bleeding kid and take her to go get stitches*? And why did your parents not apologize when I later saw them? WHAT THE H IS WRONG WITH YOU PEOPLE? It triggered a primal mama protection sequence which is still unfolding. We went and visited a new preschool and Bella had a great time. But she's four and can have a great time at the mall play area, so we are taking that into account. We are very torn on what to do. *she turned out to only need 'suture strips,' very handy little things! Next in my rundown of exciting happenings, we got a piano! I am so excited. I have always wanted a piano and it is just surreal that now we have one sitting in our living room. We decided on a digital piano, a nice one, and I think it was a great decision, even if it doesn't fit my vision of a charming wooden piano. It has several "voices," which is super fun. The jazz organ alone makes the piano awesome. And don't be surprised if I put on my Jane Austen gown and play a minuet on our harpsichord. Oh, except I don't know how to play a minuet! Minor detail. 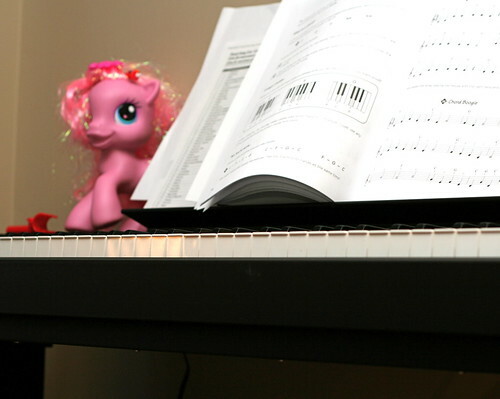 But I am so excited to take piano lessons! I am going to start in March. I am just thrilled to have a piano in our house, especially with little kids who aren't too cool to sing and dance around while I hunt and peck the ABCs. 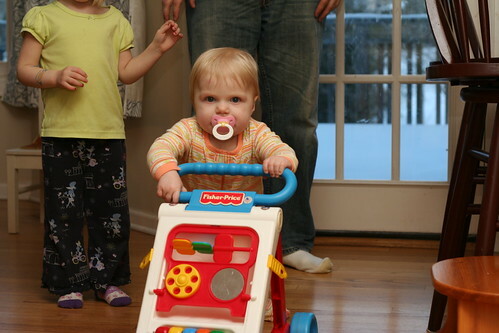 She is very proud of herself zombie shuffling behind her walker. She aims for some destination (usually Bella) and when she arrives she squeals and bounces up and down. Yay me! She gets easily distracted by all the bells and whistles on the front of the thing, stopping walking to hang over and flip a few switches like she's a mechanic giving it a little tune-up before walking on. I ordered all the plants for our new veggie garden. I hope that is a successful adventure! I also got a little carried away with ordering some new flowers for our new landscaping. But I'm not as worried about that. Flowers I can handle. (Usually.) Some of my more exciting purchases are a mix of woodland plants for the back fairy garden area, a peony bush for the front, moonflowers to climb up the deck posts, a 'tiramisu' heuchera (I love tiramisu! ), and a lime-green echinacea. I can't wait to spend the summer hanging out with our new landscaping! Maybe I can even have a garden party. And I can wear my Jane Austen gown and play the harpsichord! OHMYGOSH! 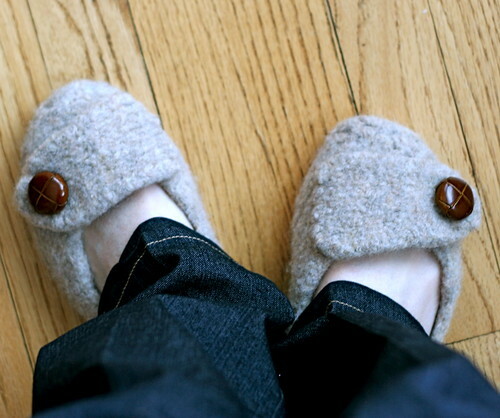 The last thing is that I made these fabulous slippers. Are they not SO CUTE? I had to do some major adjustments on the photo, since there is actual flesh exposed and it is so blindingly white that my camera exposed it like I was taking a picture of the sun. They are this pattern, which I give 4 out of 5 stars. I docked a star because my heel really turned out nothing like the heels in the picture. So either I misunderstood the pattern (I doubt it, SNIFF! ), or her heels are knit differently. But they do stay on and they look super adorable and they are very fun to slide around the kitchen in while pretending to be an ice dancer. So overall, two needles up. They are part of my wardrobe revamp, wherein I am tossing things that have been worn way past the point where I would even consider giving them away to homeless people. Out with my old ratty slippers, stretched-out bras, pajamas from tenth grade, and shoes with actual holes in the bottom. I cleaned out my closet and drawers and bought a few new things and now everything is fresh and tidy and wearable. Aren't I awesome. Definitely! Well thanks for joining me for the recap. I am off to dinner and knitting night. I hope you are having a great week! Poor Bella! I hope you find a solution for her school. And congratulations to your newly mobile one! I'm so proud she beat her first birthday. Also this: seriously? A digital piano? Do you realize this means that all future holidays will be at your place and Nick won't join us for the formal meal? Maybe you'd like to have a costume garden party. We can all take turns singing a duets. Enjoy paino lessons, sounds like fun! I'm excited to hear how your fairy garden turns out! I also did a little closet clean out and found clothes I've had since Junior high, um when did I think I'd ever wear those again. Feels great to be rid of those. Nick is the reason we got a piano! Listening to him fill your house with Christmas carols made me want a piano so bad! He is welcome to come show us how it's done anytime. Margaret, great idea! A costume garden party it is! And the sad part about my closet cleanout was that I was STILL WEARING the terrible stuff I got rid of. An even better reason to toss it!